… looks beyond the point of focus. Where modern science and myth meet. ‘The Source of Immortality’ contains an odd truth of a 52.000 year old technology what could create acoustic and magnetic levitation, heal broken bones, gave pharaohs the ability to life up until 150 years and … created many strange looking mythical creatures we know today as cyclopes, mermaids, dwarfs and many more. ‘The Quest for the Secret Knowledge of the Knights Templar’ is a book which I am still writing and meant for those who want to know about ancient rituals and its medieval secret knowledge. You are not allowed to understand this forbidden knowledge! The last two books I wrote (volume 3 and 4) have an extreme difficulty to reach the public because it will wake you up due the secrets they are revealing … it can destroy the global illusion of the system we are living in! Did you know that the covers of my books contain a secret message which lays hidden in symbolism? BLUE is the ‘above’, it tells about an invisible ‘blue source’ of ancient nations as well as todays technological side of it. WHITE is the contrast of black as well as it is the ‘shadow’ of blue … WHITE is the color of ‘the enlightened ones’ who possess the power of a true history. RED is the ‘below’ of all volumes … and shows a creepy reality of rituals, cults groups and parallel worlds which are build up from natural elements. ‘Black and blue’ is a combination which refers to the night as ‘white and red’ is referring to the day. My books are referring to two ancient groups we know today as the THULE and VRIL society. The covers of my books are showing the ‘as above,so below’ in a symbolic languish which can be red by those who ‘SEE’ the false reality. 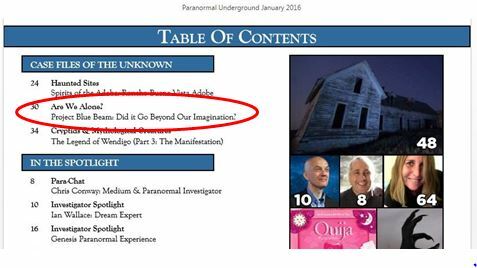 I do not know if it is just a coincidence but since the magazine Paranormal Underground is publishing my articles, some really strange things are happening in my home. Objects are disappearing and return again on the oddest places, knocking sound are being heard by all of us, something or someone told me to in the Dutch languish to wake up at 05.00 in the morning, my dogs barking while there is nothing to see … my husband and I even heard a little girl singing as if she was standing right next to us. This is all happening in real time! 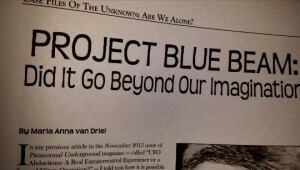 Project Blue Beam; did it go beyond our imagination? Here it is! … the latest issue of Paranormal Underground containing not only articles which will let you shiver through the night but also let you re-think some of what you have learned as a fact. 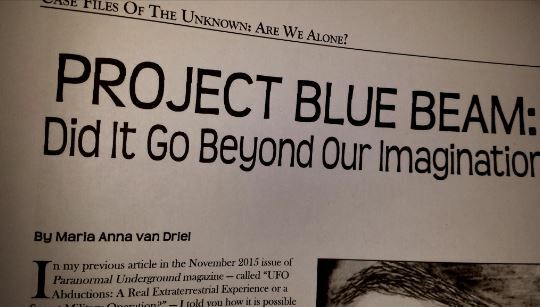 My article about ‘Project Blue Beam’ is one of them … read and re-think, sometimes the truth is scarier than the lie. A one-time chance! 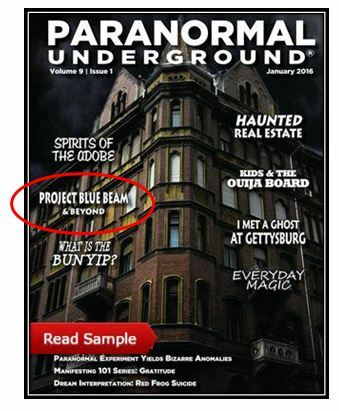 The March issue of PUG… download the PDF version FOR FREE! April 2019 Issue – Out Now! Administrator, Maria Anna on Scientists must be free to learn, to speak, to challenge anything new and to fail.